"Let the good times ... waddle." That was apparently the party-time mantra for this happy gang of duck BFFs who, earlier this week, set out from home together to enjoy a night on the town. Unfortunately, their spirited fun-seeking did end up attracting the attention of local law enforcement. The quacking quartet normally hang out around Cindy Osiecki's backyard creek, in Great Bend, Pennsylvania. On Tuesday, however, their impromptu adventure led them about a mile up the road, to a local Pump N Pantry. It's unclear why they chose that spot to hang out (but the fact that customers were giving them food might have had something to do with it). Though the ducks certainly weren't short on bills, their lack of actual spending money was apparently a problem. Sure enough, someone called the cops to report them for loitering. Evidently, the delinquent ducks decided to just go ahead and surrender. A photo shared by Great Bend Police shows the four of them filing inside the back of a patrol car. They even waited patiently while one the arresting officers stopped to take a picture. 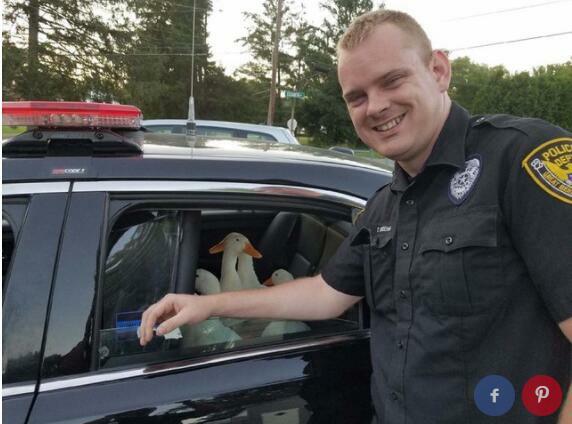 With the ducks safely detained, and the "threat" of loitering fowl now neutralized, police set about finding their owner. Fortunately, they were able to track Osiecki, who came later to pick them up. In the meantime, the ducks had plenty of time to think about what they'd done. "Our ducks are famous and they're cool and they're awesome."